Mie（三重）prefecture which can be considered as part of the Kansai（関西）region, is famous for Ise Jingu（伊勢神宮）, the most sacred shrine in Japan. Though to me, it is also a flower paradise! I have been to this prefecture quite a few times, thanks to Nagashima Resort（長島温泉）, which is close to Nagoya（名古屋）in Aichi（愛知）but geographically in Mie. 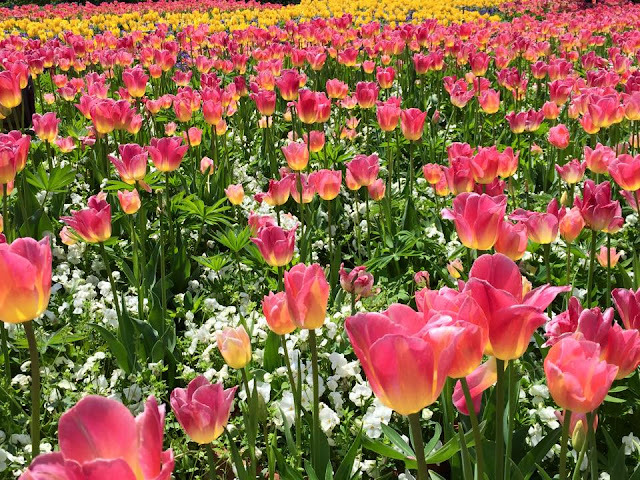 Nabana no Sato（なばなの里）is a nice park that is famous for tulips in spring, cosmos in autumn and illumination in winter. Been here 3 times in different seasons. It is the place that made me fall in love with begonias! Though it can be really crowded during weekends and holidays in the peak season, and entrance fee has been getting more expensive. Nagashima Resort also has an amusement park, the biggest outlet mall in Japan, and a hot spring facility. It is okay to make a day trip here from Nagoya, though to cover all 4 attractions, one night stay would be necessary. There are a few hotels nearby. Of course, I went to Ise Shrine. When I visited in July, it was crowded with locals. The inner shrine "Naiku"（内宮）is big and surrounded by nature. Structures are ancient and simple, pure Japanese architecture style. According to tradition, the shrine is rebuilt every 20 years. When I went in 2012, the 62nd rebuilding was taking place, to be completed in 2013. Okage Yokocho in Oharaimachi just outside Naiku is an Edo period themed area with many restaurants and shops selling local souvenirs. There are many interesting food to try here, such as Akafuku（赤福）, a type of red bean mochi, Ise Udon, for people who like their noodles soft, and Tekonezushi, raw tuna marinated with soy sauce on rice in wooden bowl. I also got to try Matsusaka beef（松阪牛）here, 1 of top 3 beef in Japan. The outer shrine "Geku"（外宮）nearer to Iseshi station has less things to see/do. During this trip, also visited Iga Ueno（伊賀上野）, castle town known for ninja（忍者）! Iga Ninja Museum's premise is not big, but the visit was pretty entertaining. There is a museum showcasing ninja artifacts and sharing interesting facts in Japanese and good English about ninja, a ninja residence where guides bring visitors around and explain about the various traps, and also a ninja show. There is also Ueno Castle（上野城）nearby, rebuilt with wood only, so it looks original.